It’s Never Been Easier to Earn Free Points with the Chatrium Point Plus App! At Chatrium Hotels and Residences we truly appreciate the trust our respected guests put in us, which is why we introduced the Chatrium Point Plus CPP+ loyalty program for our most valued visitors to recognize and reward them for their continued custom and support. We’ve a whole host of exciting rewards exclusively for CPP+ members, from deliciously delectable food and beverage vouchers and luxurious one-night stays to full-day meeting packages and even a THB 20,000 voucher to spend at the Emporium or Siam Paragon for the ultimate shopping spree! And now all these enticing extras are literally at your fingertips with the Chatrium Point Plus App, where for a limited time only if you download the app from Google Play and the App Store existing members will receive an instant 100 points FREE with new members earning 100 points FREE with their first booking. 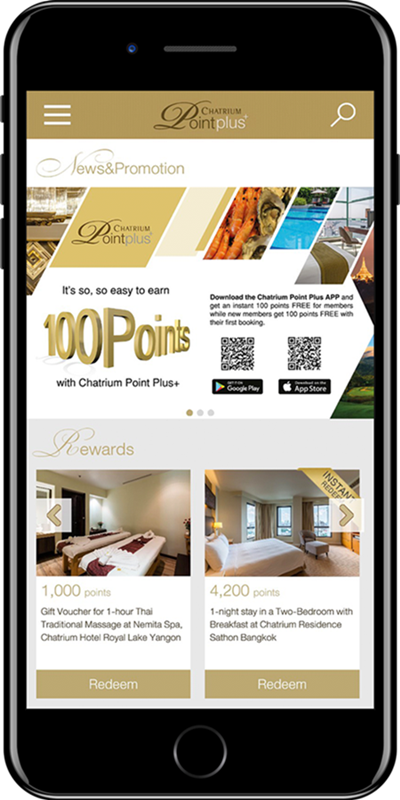 With Chatrium Point Plus app, you can instantly check or redeem your points and it is the ultimate in convenience as you can access it whenever and wherever you want. Earning points is simplicity itself. For every booking, meeting or banquet event made in a participating Chatrium Hotels and Resorts property, you’ll earn points that you can accumulate to redeem against a wide range of rewards and privileges only available to CPP+ members. You’ll earn 1 point for every THB 50 or US$ 2 spent. The free 100 points offer when you download the CPP+ App is available from now-31 December 2017. Chatrium Point Plus is open to individuals or corporate clients who make a booking at any of our participating properties (Chatrium Hotel Riverside Bangkok, Emporium Suites by Chatrium, Chatrium Golf Resort Soi Dao Chanthaburi, Chatrium Hotel Royal Lake Yangon, Chatrium Residence Sathon Bangkok and Maitria Hotel Sukhumvit 18 – A Chatrium Collection) through the property’s reservation department or the Chatrium website. Bookings made through a third party are not eligible to earn points. Membership is free but not transferable. To check your existing points, log-on to the Chatrium Point Plus App or Chatrium Point Plus website at any time, where you can also reserve the remarkable rewards you’d like to redeem. Previous PostPrevious Chatrium Residence Sathon Makes Bangkok Beautiful!